I'm sure Capcom fans are loving all the disc-locked content that the company has planned for them. In addition to having 12 characters, additional colors and costumes as paid-for content arriving this fall for console and PC gamers, hackers have also discovered that additional combos can be bought for the characters as well. What's more is that these preset combos are also DLC...no, not downloadable content, disc-locked content. The news comes courtesy of Hadoken, which reveals a screenshot containing additional preset combos for Ryu, with three additional preset combos available with a basket icon next to them. 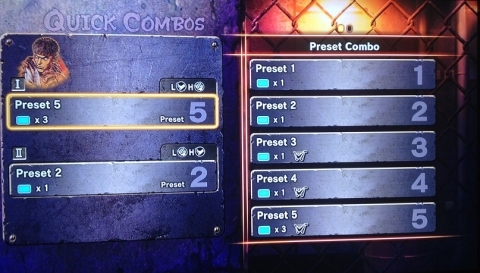 The preset combos were part of the disc-locked content that hackers uncovered this past weekend. Heh, I'm curious what else they found on there? A whole new game maybe? Anyways, Capcom has verified that there will only be one disc-based version of Street Fighter X Tekken, there will not be a Super Arcade, Hyper Turbo, Ultimate Tournament Edition like with their previous games. Instead, Capcom has admitted that all the future updates and content for the game are already contained on the disc you buy from retailers, this includes extra colors, clothes, costumes, moves, combos and characters. You'll have to wait until this fall to buy the items already stored on the disc you purchased from retailers. Capcom has yet to formally announce the preset combo DLC but given that we care about keeping gamers informed, you now have a heads-up as to what additional DLC you'll be able to pay for, which is already located on the disc you just bought. Some gamers have become so infuriated at this on-disc DLC that they have resorted to pirating the Xbox 360 version of Street Fighter X Tekken. However, we don't condone piracy.